we ate mexican before her appointment, and she was b.a.d. she has gotten to where she doesn't want to stay in the high chair for very long, so if i'm not with someone, i pretty much don't get to eat! 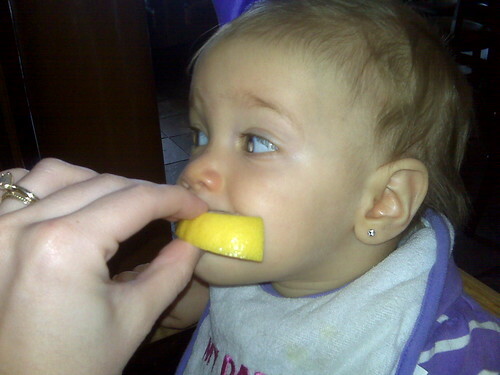 i was trying to occupy her for a little bit with a lemon. her pediatrician told me to start giving her a lot more table food. i haven't been giving her a whole lot of it because of no teeth, but he said to go ahead and let her "gum it to death." ha! also, he said that she can have 2% cows milk, but i decided to hold off on that for a little while. we talked about weaning her from breastfeeding, and he said that if i don't do it soon, then it will be very hard to do it later. BUT that it was totally my decision, and that there are no rules. 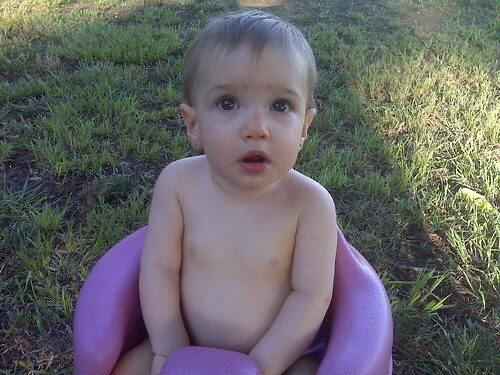 of course, i knew that, but i was just seeing what his opinion was on weaning at her age. so, i guess we'll stick it out a little longer. i really want to try to make it a year. later last night, we spent some time outside. she just loves being outside. it was so nice, and we had a good breeze! I'm with Cyndy on this one. Please don't feel pressured to wean early. My goal with Alyssa was one year and that's exactly what I did. One year to the day. I was so ready to be done and she wasn't. When I had Audrey, I made it a point to just go with the flow and nurse as long as we both were comfortable. With her I went to 15 months and weined her then because at that point she was not nursing for nutrition but for comfort and I wanted her to become more independent. With Livvie, I'm going to do exactly what I did with Audrey. It's such a special time and one that I know I'll look back on knowing that I made the right choice. Long story short, do what you feel is right! P.S. I'm surprised your ped suggsted 2% milk. Ours always said whole milk until they turned two. Guess not all docs have the same thing to say on the subject!